Suitably named for its speedy sensibilities, the Castelli Men's Velocissimo Bib Short maximizes long days in the saddle with the euphoric comfort of its nine-panel design and KISS Air chamois. These bib shorts are an everyday workhorse destined for weekend club spins and grueling training rides, thanks to Affinity 210 gram Lycra. This stretchy, moisture-wicking fabric provides a body-contoured, streamlined fit. The redesigned Doppio waistband retains maximum comfort, all without uncomfortably digging into your skin or annoyingly riding up. Breathable mesh bib straps retain a secure fit without drenching you in perspiration as you push your cadence in stifling conditions. Taking design inspiration from Castelli's Progetto chamois, the KISS Air features a Bacteriostatic treatment that prevents saddle sores after long-distance rides. This seamless microfiber chamois supports and stabilizes your body with its multi-density construction, which increases in thickness from 4mm along the front and sides to 14mm along the rear where you exert more pressure. 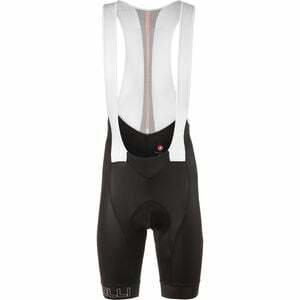 Its dimpled structure speeds up moisture evacuation, preventing the sweat-soaked feel of a less-breathable chamois. Finishing touches like sublimated GIRO3 leg grippers hold the shorts in place and reflective viz details pop brilliantly to passing traffic on the road.